lawyers | Out of the Box! Martin A. Row (1901-1995) was employed by Sun Oil Company as a land man in 1924. After finishing his law education in 1930, he was assigned to the Southwest division’s legal department. Row was Sun Oil Company’s lead lawyer in the Texas Tidelands case in the late 1940s and early 1950s. By 1960, Martin was special counsel for domestic regulatory and natural gas matters. He then became special counsel for foreign production operations in 1961. Martin A. Row retired from Sun Oil Company in 1966. The Martin A. Row Collection (1766-1957; nine boxes) consists of documents, maps, pictures, articles, books, correspondence, and legal pamphlets belonging to Attorney Martin A. Row. The collection includes legal briefs and arguments concerning Sun Oil Company as well as Martin A. Row’s professional notes on Padre Island and photographs of the Texas coast. The collection also contains Martin A. Row’s personal books and a small amount of his professional correspondence concerning the Texas Tidelands case. 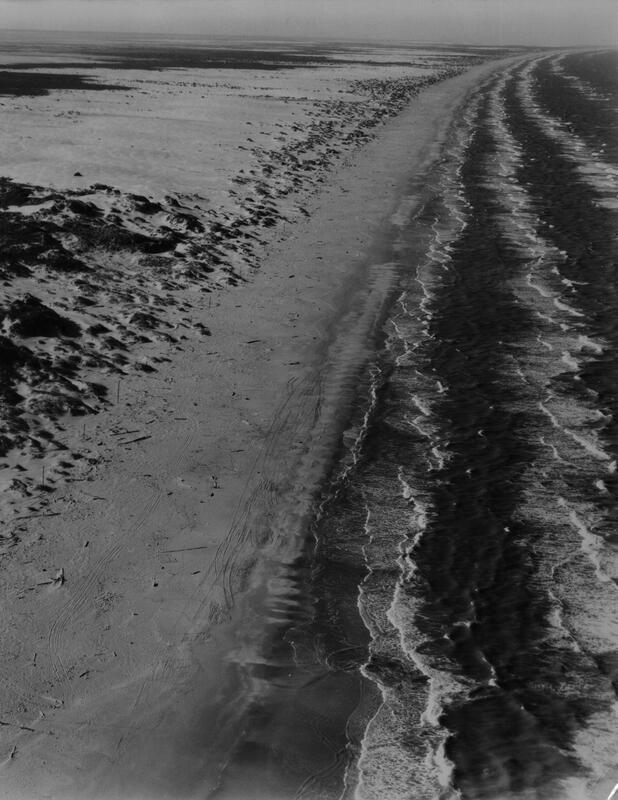 The Tidelands controversy between the United States and Texas involved submerged and coastal lands in the Gulf of Mexico. The focus of the dispute was the royalties and leasing of the submerged lands of Texas and whether the rights belonged to the Federal government or the Texas government. Franklin Barlow Sexton (1828-1900) was a successful lawyer, planter and member of the Texas Legislature in the 1850s. When the Civil War broke out, he served a time as a Confederate soldier before being selected as a representative of the Fourth Congressional District in the First Confederate House of Representatives. He served on various committees including: Commerce, War, Military and Tax. He was re-elected in August of 1863. This made him one of two Texans to have served on both terms of the Confederate Congress. 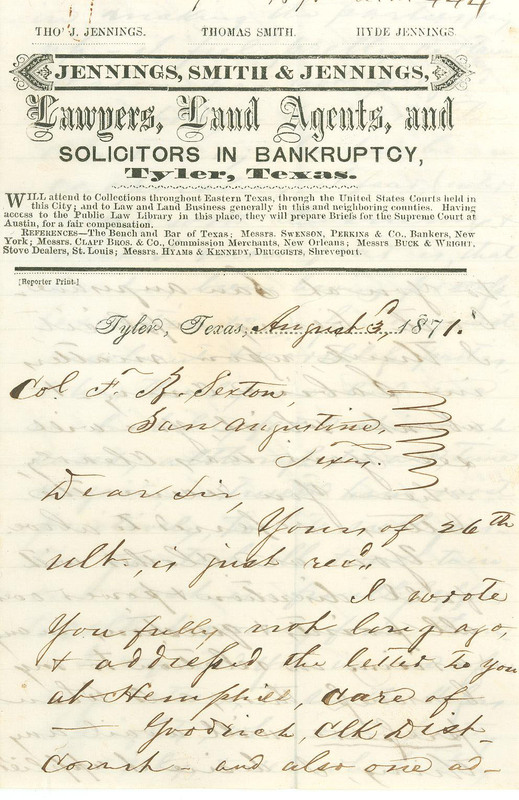 After the war he relocated to San Augustin, Texas to continue practicing law and served as attorney for the T. & P. Railway. His daughter, Loulie, married Harry F. Estill, a very popular and well-respected President of the Sam Houston State University who served in that office for 28 years. The Sexton Family Papers comprises of correspondence, notes, business transactions and ephemera representing a part of the history of the life of Confederate Legislator, Franklin Barlow Sexton. The correspondence represents a wide range of personal and business communication. Some of the most common are in in regards to issues of deeds, receipts, requests for payment and memoranda. Newspaper clippings spanning a variety of topics, some of which are: agriculture, national defense, oil in Texas, poems and poets, churches and the history of Texas. Tuition record for the Marshall Masonic Female Institute where two of Franklin Sexton’s daughters attended school.